lgae found in thermal springs and other extreme environments have heated up a long-standing debate: Do eukaryotes — organisms with a cell nucleus — sometimes get an evolutionary boost in the form of genes transferred from bacteria? The genomes of some red algae, single-celled eukaryotes, suggest the answer is yes. About 1% of their genes have foreign origins, and the borrowed genes may help the algae adapt to their hostile environment. The new research was posted recently as a preprint on bioRxiv. The group provides a “fairly nice, rock-solid case for horizontal gene transfer” into eukaryotes, says Andrew Roger, a protist genomicist at Dalhousie University in Halifax, Canada. Many genome studies have shown that prokaryotes — bacteria and archaea — liberally swap genes among species, which influences their evolution. The initial sequencing of the human genome suggested our species, too, has picked up microbial genes. But further work demonstrated that such genes found in vertebrate genomes were often contaminants introduced during sequencing. In 2015, after analyses of millions of protein sequences across many species, William Martin, a biologist at the University of Dusseldorf (UD), in Germany, and colleagues concluded in Nature that there is no significant ongoing transfer of prokaryotic genes into eukaryotes. Dr. Martin believes any such transfers only occurred episodically early in the evolution of eukaryotes, as they internalized the bacteria that eventually became organelles such as mitochondria or chloroplasts. If bacterial genes were continually moving into eukaryotes and being put to use, Dr. Martin says, a pattern of such gene accumulation should be discernible within the eukaryotic family tree, but there is none. Debashish Bhattacharya, an evolutionary genomicist at Rutgers University in New Brunswick, New Jersey, and UD plant biochemist Andreas Weber, took a closer look at a possible case of bacteria-to-eukaryote gene transfer that Dr. Martin has challenged. The initial sequencing of genomes from two species of red algae called Cyanidiophyceae had indicated that up to 6% of their DNA had a prokaryotic origin. 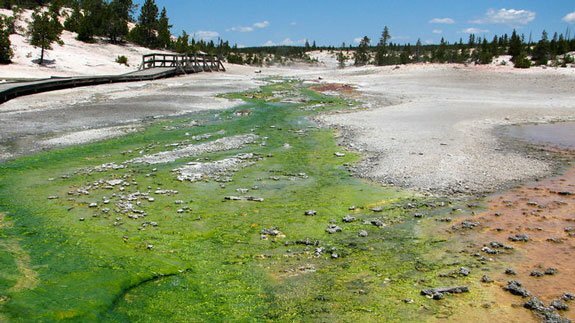 These so-called extremophile algae, which live in acidic hot springs and even inside rock, can’t afford to maintain superfluous DNA. They appear to contain only genes needed for survival. “When we find a bacterial gene, we know it has an important function or it wouldn’t last” in the genome, Dr. Bhattacharya says. He and Dr. Weber turned to a newer technology that deciphers long pieces of DNA. The 13 red algal genomes they studied contain 96 foreign genes, nearly all of them sandwiched between typical algal genes in the DNA sequenced, which makes it unlikely they were accidentally introduced in the lab. “At the very least, this argument that (putative transferred genes are) all contamination should finally be obsolete,” says Gerald Schoenknecht, a plant physiologist at Oklahoma State University. The transferred genes seem to transport or detoxify heavy metals, or they help the algae extract nourishment from the environment or cope with high temperature and other stressful conditions. “By acquiring genes from extremophile prokaryotes, these red algae have adapted to more and more extreme environments,” he says. Dr. Martin says the new evidence doesn’t persuade him. “They go to great lengths to find exactly what I say they should find if (horizontal gene transfer to eukaryotes) is real, but they do not find it,” he says. Others argue that gene transfer to eukaryotes is so rare, and the pressure to get rid of any but the most important borrowed genes is so strong, that transferred genes might not accumulate over time as Dr. Martin expects.